One of the most useful pieces in my set is the piece I use to represent the person I am reading for, whether I am reading for myself or someone else. I think that this piece is the reason I was able to move from relying on a layout pattern on my reading surface, whether drawn or imagined, to just throwing onto a blank cloth in free-form and being able to make sense of what I saw. 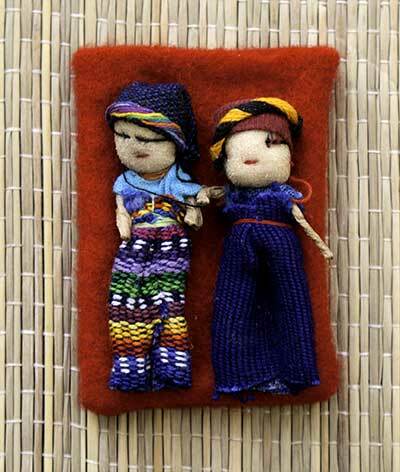 A piece representing the querent gives you a starting point in the reading. Pieces nearby can be interpreted as what is happening around the querent. Pieces further out might be interpreted as possible future events. If the piece you choose for this has two easily identifiable sides you can interpret them as the person being aware or unaware, involved or uninvolved, enthusiastic or apathetic, accepting or in denial, interested or disinterested, or any other set of meanings you choose. You can use anything for this piece. 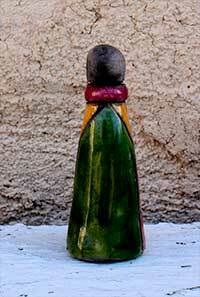 I use a raku ceramic figure, but I have several pieces in my extras box that would serve well for this. I include several pictures here to give you some ideas. 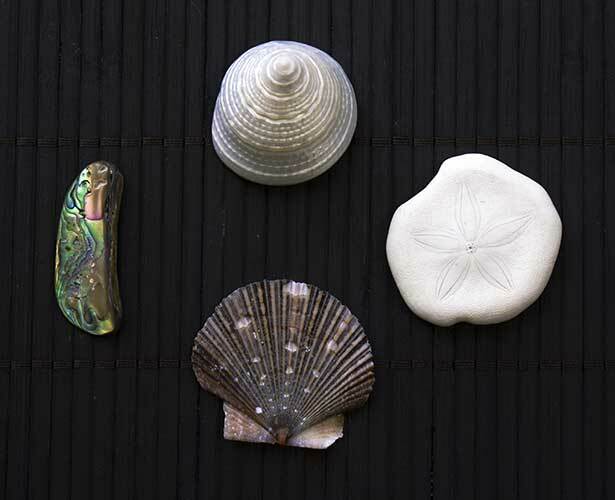 You could also use a bone already in your set, a shell, or a curio. 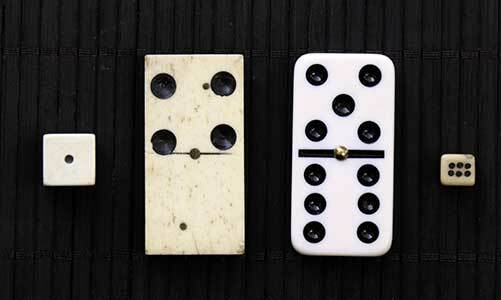 In her book Throwing the Bones, cat yronwode discusses using a domino or die as the “client’s representative in the situation.” You can then get further insight by interpreting the whether the domino is face up or down, or by interpreting the number showing on the die. Whatever you choose, it is helpful if it is large enough and/or different enough to spot easily in a jumble of pieces allowing you to locate it right away to start the reading confidently. If you have not been using such a piece you might want to give it a try. I attended a bone-reading workshop with cat yronwode on 29 December at Parmita’s Parlour of Wonders in Santa Monica. Cat started by giving some history of bone reading in various cultures. This conversation followed her book somewhat, but also went into more detail in some subjects. She discussed what is considered bones—shells, for example—and reading with dice, dominos, and shells. For people who did not already have the book, this was all new, but it was more of a review for those of us who had already read the book. The book was provided to all attendees as part of the attendance fee. After she provided background information, bone sets were distributed to all attendees who wanted them, again as part of the attendance fee. Some preferred credit toward new pieces because they already had bone sets. Cat talked about meanings for various pieces and then demonstrated various ways to do readings. This was the most valuable part of the workshop in my opinion. She demonstrated everything from basics such as how to toss the bones onto the reading surface, to professional readers’ tips. Two other readers had brought their sets, which allowed attendees to see how the basic sets can be personalized. Cat then had everyone try a throw of their own new sets and went around helping each person interpret what they had. As she went around helping students, those who were finished were able to buy additional bones for their sets, as were those who chose credit because they already had a set. I bought a few new pieces, though I haven’t added them to my reading set yet. If cat gives a workshop within a reasonable distance from you, I strongly recommend that you attend. While her book is a great starting point, there is nothing like hands-on, in-person training. Her enthusiasm is contagious, and while two hours is not much time, I think that everyone left the workshop with a good foundation for starting to work with the bones. I have four different bone sets, soon to be five. 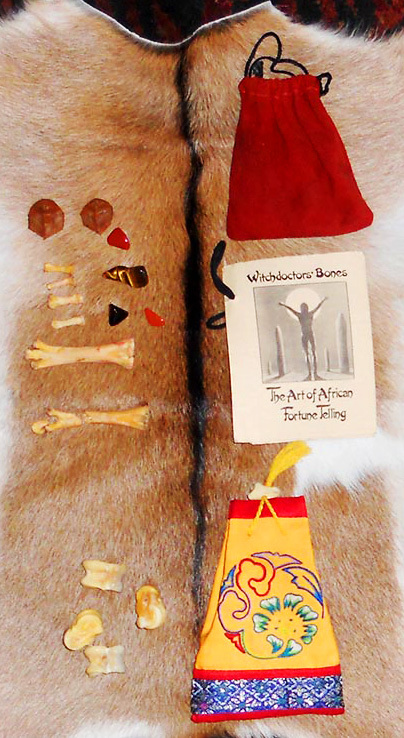 The first one I acquired is a set called “Witchdoctor Bones: The Art of African Fortune Telling.” I bought this so long ago that the bones have dried out and one has cracked in two places. It is a simple set that comes with six bones, four stones and two nuts of some sort. There is a small pamphlet of instructions that was originally yellow, but now is turning brown with age. The instructions are brief and not very enlightening. I couldn’t make much sense of them so I put them away. I acquired my next set on my first visit to the Lucky Mojo Shop over ten years ago. 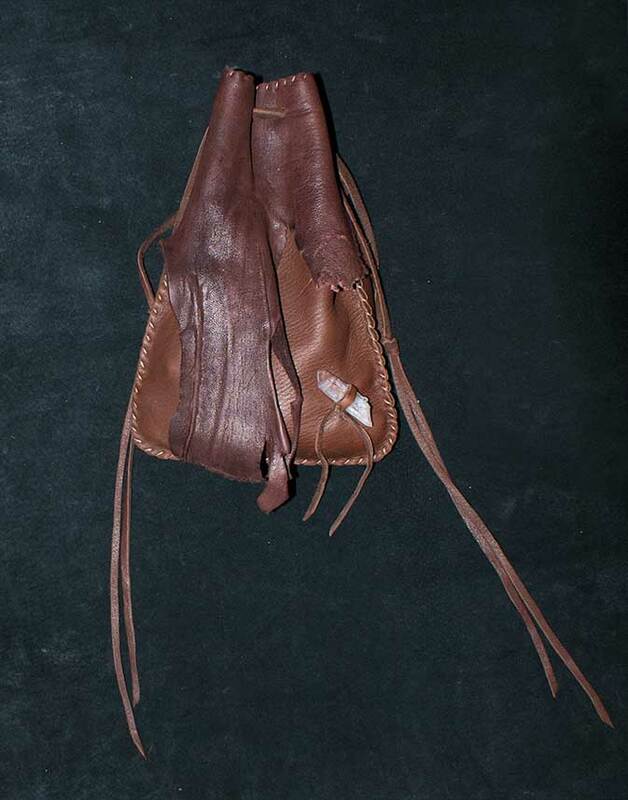 It was a set of Shagai and it came in a small embroidered pouch, with a one page sheet of instructions. It consisted of four sheep astragali. 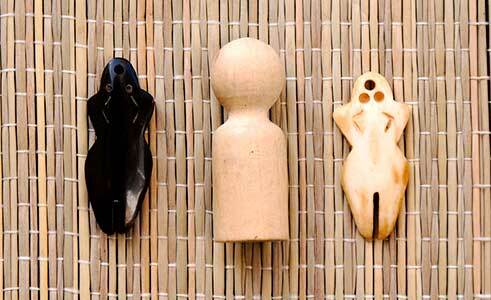 The bones have four faces and you take the number from each face and determine the meaning of the toss from the numbers. You can find the instructions in cat yronwode’s Throwing the Bones (page 50), and in the book Riding Windhorses. This set was very easy to understand. The most difficult thing was learning to tell which side of each bone was showing so that you could determine its number and refer to the answer sheet. It was fun, but not very challenging. As a tarot reader, I had what I thought was a better means of divination available to me, so the Shagai were also put away after a brief while. I got my third set from Lucky Mojo also. It is a Bone Reading Set, item number DIV_BON_SET1. It consists of fifteen items, a muslin bag with an item list, and a double-sided page of instructions. You can see one that is very similar to it here. I was in the San Francisco Bay area visiting friends when I purchased it. On the first night of my visit one of my hosts did a bone reading for me. I didn’t have a question at the time so I just made something up off the top of my head. The reading was so good that it even indicated that my question was BS. The next day we were off to Lucky Mojo with the bone set being number one on my list of things to purchase. I got a set of my own and I got to visit with cat and nagasiva for a little while. Cat demonstrated some things about the bone set and made some recommendations on things to go with the basic set, which I bought. 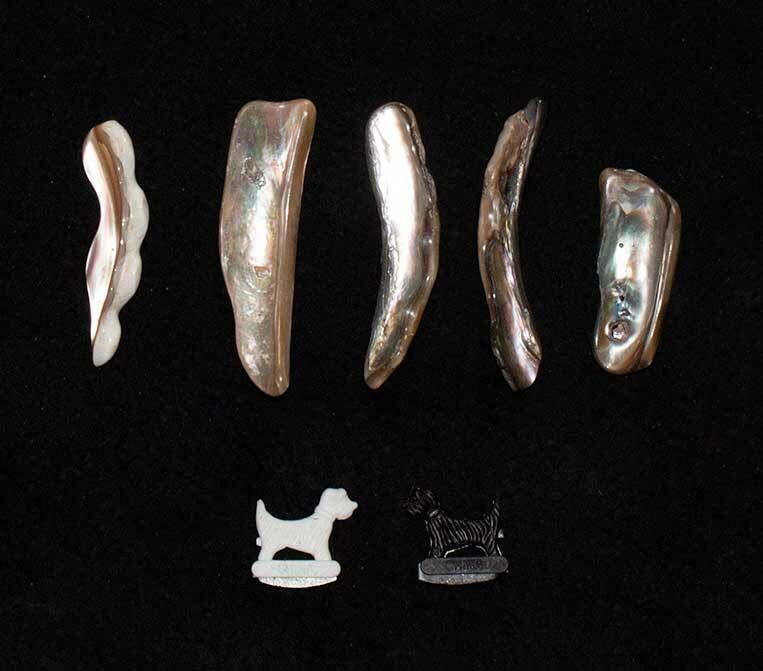 I also purchased a bunch of small items to go with it of the type that you really have to be in the shop to appreciate, and I purchased cat’s new book Throwing the Bones. It was like being a small child in a candy shop. I had to pass on the silver-lined kapala though, as it was a bit out of my price range. I started reading the book and playing with my bones immediately. I played with them every evening of my visit and I have continued to work with them almost every day since. My enjoyment and interest in the bones and all things bone related led to my purchasing The Oracle of the Bones, by Claire O’Neil. It is interesting in its own right, but it is a fixed system, with four resin bones, a reading cloth and a book with meanings of different thrown configurations. It is out of print now, but it is still readily available used and in some cases new. My original Lucky Mojo set of fifteen items has changed quite a bit. I have added and removed pieces such that it is now a truly unique and personal tool. It has many more pieces for one thing. I also made a couple of reading cloths and I bought a goat skin to use a reading surface. It makes an aesthetically pleasing backdrop for the bones. You can see a bit of it in the header above. Bone reading systems have been around almost as long as mankind, yet I have found that there is a dearth of written material on how to read the bones. Cat yronwode’s book is a good starting place, and every time I have had a reading done by another reader I have learned something new and interesting about bone reading, even if it is only how many different ways there are to do it. There are still some people who learned to read the bones in a family or other traditional manner. Some are even on the Internet. I suspect that as bone sets become more available, and as more people try them, they will become increasingly popular. The method I use is not based on any tradition, but it works for me. Judging from the number of people now offering bone readings I suspect that I am not the only one who has found this to be so. I have spent more hours on the bones than I care to think about, when I should be doing other things. Yet my enthusiasm hasn’t waned – it has increased. This blog is a way for me to express and share my enthusiasm.